Meanwhile, most Venezuelans have a negative opinion of Venezuela’s political and economic ally, Cuba. The two countries have a very interdependent relationship, with Venezuela sending Cuba subsidized oil in exchange for Cuban doctors, teachers and military advisors. Yet 57% of Venezuelans give Cuba an unfavorable rating, with fully 38% saying they have a very unfavorable impression of their trade partner. Only 37% have a favorable outlook. The most notable difference of opinion hinges on political ideology. While roughly seven-in-ten (72%) left-leaning Venezuelans view Cuba favorably, only 14% on the right share this attitude. 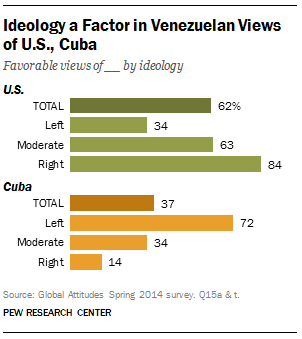 Moderates also tend to be more disapproving of Cuba (34% favorable v. 54% unfavorable). Protestors in Caracas earlier this year, lauded by opposition groups in both Venezuela and Cuba, attributed such feelings to the perceived “Cubanization” of Venezuela, claiming that the Cuban government increasingly plays a role in Venezuelan efforts to suppress dissidents and wants to force Cuba’s strict socialist ideas onto Venezuelans.